The Inclusive Economy Partnership (IEP) is a Government initiative changing the way that government, business and civil society work together to address some of society's toughest challenges. Between August 2017 and September 2018, Nesta led the Inclusive Economy Partnership Accelerator, supporting 18 IEP grant winners across three challenge areas to scale through meaningful partnership with business, civil society and government. Since then Nesta has been providing advice, guidance and support to grow the Inclusive Economy Partnership beyond the success of the pilot. 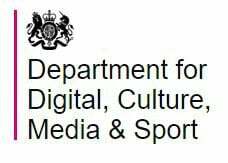 The partnership is supported by the Cabinet Office and the Department for Digital, Culture, Media and Sport (DCMS). What is the IEP and what was Nesta’s role within it? The IEP is a partnership of businesses, civil society and government departments that are working together to solve some of society’s toughest challenges, helping all communities and everyone within them to feel they belong to and can participate in the UK economy. Through collaboration, innovation and a shared determination to make the UK a better place to live and thrive, the IEP is part of a growing global movement that’s trying to solve age-old problems with new ways of thinking and collective working. Nesta believes it’s possible to drive transformational change through scaling solutions to maximise their impact. As a result, between August 2017 and September 2018, Nesta’s Inclusive Economy team ran the Partnership Accelerator for the IEP, developing a replicable model of how we can tackle big societal issues through partnerships, and are now helping the Cabinet Office and DCMS with the design and delivery of the programme. Through the Partnership Accelerator for the IEP, Nesta successfully supported 18 IEP grant winners across three challenge areas to scale through meaningful partnership with business, civil society and government. Ten million working people lack access to affordable and high quality financial products and services. Through the IEP, Nesta provided funding and non-financial support to six organisations providing the financially ‘underserved’ with the tools and capabilities to access and interact with fair financial products; products that will help individuals to manage problematic or persistent debt, to gain access to affordable credit options, and to create a savings buffer as part of healthy day-to-day budgeting. 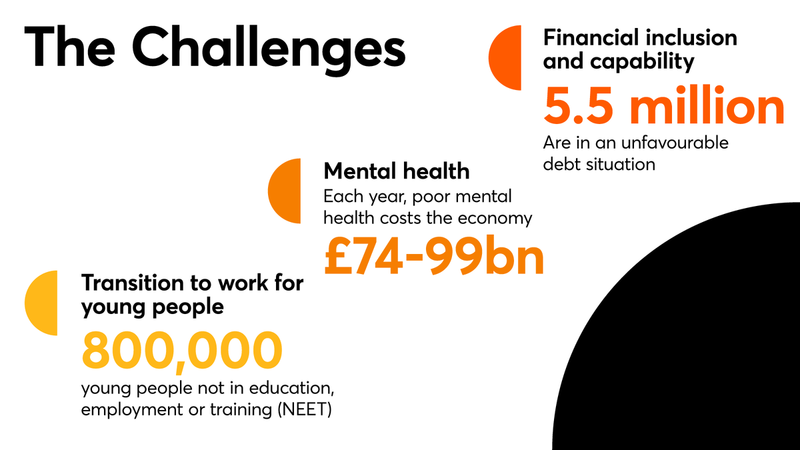 Mental health problems are one of the largest public health challenges facing the UK, with one in four people suffering from a mental health problem annually. Nesta supported five organisations enabling businesses to positively impact the mental health of their employees, customers, suppliers and wider communities. By supporting businesses to implement changes within their organisations, the mental health of employees can be improved. Tools and training development can support employees and line managers, and improving the mental health of customers, communities, supply chains and SME networks will help address this challenge. Young people in the UK are over 2.5 times less likely to be employed than the average for the working age population. Nesta supported seven organisations in the transition to work stream, helping the movement of young people from education, unemployment or inactivity into jobs. Building engagement with the world of work through platforms that link employers to schools, young people and their parents or carers. Supporting activities for young people that help them to gain access to skills and experiences that develop their resilience and employability. Enabling businesses to adapt their processes for hiring, structuring roles and engaging new employees so that young people can be supported to successfully progress. What did the IEP Accelerator achieve? Collaborations were developed for lasting impact, and the IEP programme was designed for innovative and promising ideas to be supported in achieving change in core challenge areas. 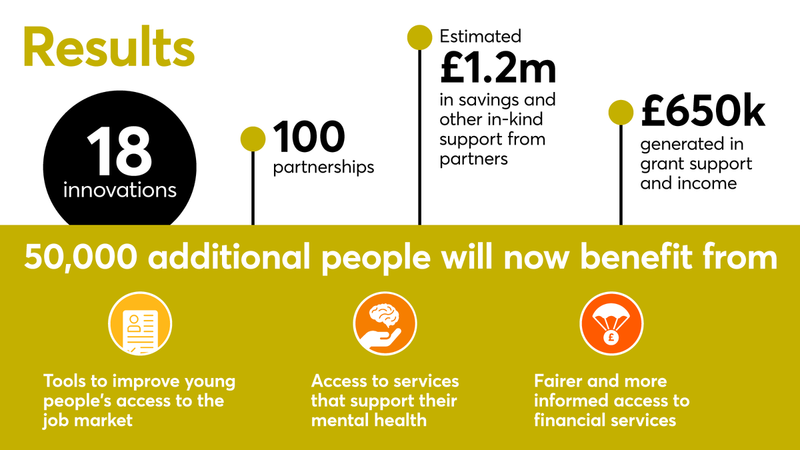 Over the six-month period we supported our 18 grant winners to build 100 partnerships and support a further 50,000 beneficiaries of their programmes. We have produced a report and an infographic which show how we ran the accelerator and its success. Whilst the inaugural IEP accelerator has come to a close, the IEP remains ongoing. To find out more about the broader IEP agenda, forthcoming collaborative projects and future initiatives, visit the IEP website and sign up to the IEP bulletin. FinTech solution using financial behaviour data to measure creditworthiness, meaning lenders will be able to accept applications from currently overlooked borrowers at more competitive rates of interest. Modular financial capability programme introducing all aspects of money management. Resources and training are provided to organisations such as Church Groups and Community Organisations whose front line staff work with target groups to deliver the programme. Providing money advice and education to Black, Asian, Minority Ethnic and hard to reach populations in London through advice, workshops, mentoring and training. Alternative lending platform enabling employers to offer a valuable financial service to employees at no cost or credit risk to themselves with repayments taken directly from their salary. A programme of 1-to-1 mentor sessions to break the cycle of youth homelessness by training first-time tenants with the skills and confidence to live independently and avoid money problems. An earning-over-saving focused financial inclusion programme delivered in person and over the phone as a route to higher engagement delivered through the Citizens Advice Bureau in seven regions. Mobile app combining interventions to improve resilience and enable users to self-manage mild anxiety and depression. A peer counselling programme to make therapeutic talk accessible to many for whom cost or stigma is a barrier to mental health treatment. Mobile app focused on understanding and improving mental health in the workplace by asking users short questions at random intervals and providing anonymous feedback to their organisations. A programme aimed at creating mentally healthy workplaces and inclusive cultures through storytelling to reduce stigma, dispel myths and improve wellbeing for good. Provides a package of support including toolkits, workshops and mentors. 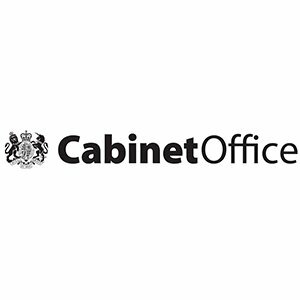 Developing widely-applicable 'accessibility standards for mental health', helping to provide customers with mental health problems equal access to essential services. A recruitment agency supporting dyslexic and neurodiverse young people not in education, employment or training (NEET) by celebrating their strengths. Give employers access to 250,000 NEET dyslexic employees. ToolShed supports young people aged 16-24 in their self-development, construction training, education and employment so that they are able to become positive role models in the community and inspire other young people to take charge of their lives. Applied is a tech platform that uses behavioural and data science to make hiring smarter, fairer, and easier for HR departments and those responsible for recruitment. The Workfinder mobile platform enables young people aged 16-24 to search and apply for work experience placements in growing businesses. Supporting disadvantaged young people into work and beyond via a mobile platform that provides employer digital-mentoring, skills, and a peer-to-peer forum. A programme supporting young people not in Education, Employment orTraining to identify their strengths, develop motivation and build capability to find and sustain work. A self-paced career coaching toolkit for parents and carers to transform teenagers’ career prospects for the better, using video, ebooks and companion facilitator guides.